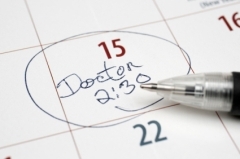 We offer routine appointments—these can be booked up to four weeks in advance with the clinician of your choice from 8.30 am Monday - Friday. Please be prepared to give the receptionist a brief description of your symptoms so they can ensure you are seen as quickly as possible by the correct healthcare professional. Emergency appointments are available every day if you feel you have an urgent medical need. Please be aware that the doctors will deal with ONLY ONE PROBLEM for these emergency appointments. For patients unable to attend during normal hours we offer evening GP appointments, bookable in advance from 17:30 onwards on either Tuesday or Wednesday. Blood tests and chaperoned examinations cannot be offered in the evening. Your local chemist will be happy to advise you on many common ailments. Under the Minor Ailments scheme, a pharmacist with whom you are registered can provide treatment for these, and for patients (including children) who are exempt from prescription charges. From time to time a nursing student may accompany one of the doctors or nurses. Your help in allowing them to listen and learn would be much appreciated but we will always ask for your consent in advance. If you are unable to keep an appointment please telephone 332 7696 from 08:00 to cancel so that the slot can be offered to another patient. Patients who repeatedly fail to attend booked appointments without cancelling will be contacted by letter and may be asked to register elsewhere.